The Walk Review: Sure He Walked Between the Twin Towers, But Why? 1 Comment on The Walk Review: Sure He Walked Between the Twin Towers, But Why? These lines are repeated exactly by Gordon-Levitt near the end of The Walk. However, it is a viewpoint which is also stated from the outset since The Walk features Gordon-Levitt’s Petit standing atop a rooftop with a clearly cgi New York skyline behind him and talking directly to the camera to effectively narrate his own story. He defiantly tells us in the very first scene of the movie that asking him why he wanted to walk the towers is akin to asking Michelangelo or Da Vinci why they wanted to make their most famous paintings. Those paintings simply came out of them as per their artistic impulses, and the same is true for him. The Walk wants us to relate to the spirit of Petit’s story and find it inspiring. If you’ve ever felt oddly compelled to satisfy an almost inexplicable creative impulse or been motivated by an unceasing ambition to reach the top of your profession you can surely relate to Petit’s need to create what he continually refers to as his masterpiece. Zemeckis certainly admires Petit as a showman and storyteller. 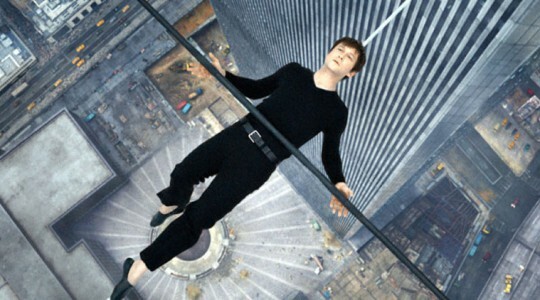 The Walk arguably uses his story as a metaphor for the act of filmmaking. Petit functions as the ultra-determined director pursuing his vision with a singular focus, and his personality defects (e.g., extreme arrogance) are a direct result of that. His various collaborators, including those he brought with him from France and those he met in New York, function as the various members of a film production who gather around the director and do everything in their power to help him achieve his vision. In that reading of The Walk, the first half of the story is the “making of” portion, and the last half, i.e., the actual walk, is the big premiere. Petit’s narration is the director’s commentary. If you can get past all of that, and if you can give in to this film even though its ending is never in doubt, then The Walk is actually a rather enjoyable viewing experience. Despite his, um, let’s go with “adventurous” French accent, Gordon-Levitt’s showboating energy and agility carries you along, even as the film acknowledges that Petit and his occasional tempter tantrums could be a tad insufferable. There are multiple charming sequences early on where we see Petit’s initial attempts at wire-walking and work with a circus, which is where we meet his mentor (Ben Kingsley). Petit’s sweet-natured courtship of a guitar-playing kindred spirit named Annie (Charlotte Le Bon) threatens to steal the movie as you find yourself wanting to see more of the two of them together and less of him recruiting of new collaborators (first a photographer, then a mathematician afraid of heights, then a….well, it keeps going like that). Once they all finally get to the towers and begin their “coup,” as Petit calls it, it plays like a masterclass in how to build tension in film. There is a giant elephant in the room the entire time, though, and that is the fact that there is already an Oscar-winning documentary, Man on Wire, which covered all of this. It has the actual Petit telling his own story, and the actual footage of his death-defying walk. Moreover, unlike more traditional documentaries Man on Wire also dramatizes multiple portions of the story, hiring lookalike actors to recreate the sections where Petit and pals conned their way into the towers. There is even a lovable whimsy to it. For example, Petit first learned of the twin towers via a magazine he glimpsed while waiting in a dentist’s office. In Man on Wire, this is recreated in black & white and filmed through a fish-eye lens, giving it the appearance of an old French film. However, The Walk does the same exact thing for that particular scene. If you’ve never seen Man on Wire before, when that scene pops up in The Walk it’s whimsical. 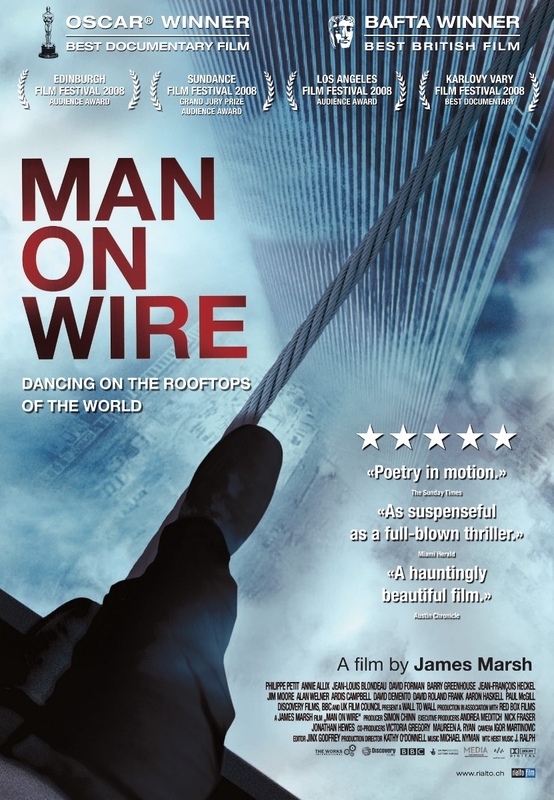 If you have seen Man on Wire, though, that scene is a frustrating reminder that The Walk might not be making a compelling argument for why it actually needs to exist. That’s where the titular walk comes into play. The real reason The Walk exists is because Zemeckis couldn’t resist the cinematic possibilities of one man’s 48-minute walk between the tallest buildings in the world. His camera can get to places Man on Wire, limited to the actual archival footage, never could, and the moment Petit first steps on his wire is an instant stomach-churner. However, this sequence was also meant to be viewed in 3D and on the biggest screen possible, and that ship has sailed at this point. I am never going to know what it was like to have an immersive viewing experience with The Walk through 3D IMAX, and at times when I watched it on my 49-inch HD TV I could merely imagine what I was missing out on. That particular spirit didn’t quite make it into The Walk. Despite the film’s obvious effort to function as a testament to the human need to create art, it sometimes feels close to “it was really cool that this one guy did this one thing that one time.” Thankfully, though, what he did was indeed pretty dang cool, and it translates to some truly arresting visuals, albeit ones which have been lessened in the transition from theaters to home video.